H.H. Tathagata Dorje Chang Buddha III is recognized! 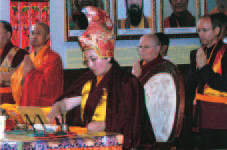 written by Venerable Akou Lamo Rinpoche / Wearing a dharma hat, Venerable Akou Lamo Rinpoche conducts a Dharma Assembly for rinpoches, dharma teachers, and laypersons. Traditionally, the vidyas are divided into the five major vidyas and the five minor vidyas. The five major vidyas are the silpakarmasthanavidya (craftsmanship vidya), the cikitsvidya (healing vidya), the sabdavidya (sound vidya), the hetuvidya (causality or Buddhist logic vidya), and the adhyatmavidya (inner realization vidya). The five minor vidyas are rhetoric, ornate diction, prosody, dramaturgy, and astronomy. Actually, the Five Vidyas are not that narrow. Everything in the universe can be classified into five aspects of brightness and darkness. To develop everything that is good in the universe and that benefits living beings is classified as “bright.” That which confuses and is bad is classified as “dark.” This is the real meaning of the Five Vidyas (Five Bright) of which the Buddha spoke. 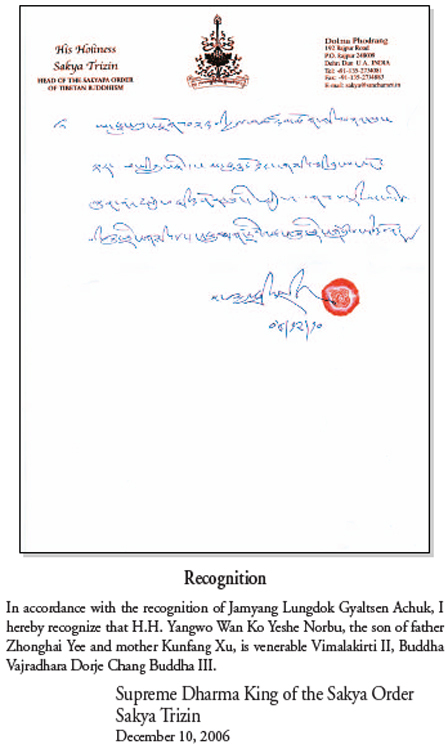 The category of recognitions and congratulations mainly makes public the original recognition certificates and corroborating congratulatory letters written by dharma kings, rinpoches, and eminent monastics in the world of Buddhism today to H.H. Dorje Chang Buddha III Wan Ko Yeshe Norbu Holiest Tathagata. This category also contains brief introductions to these dharma kings, regent dharma kings, rinpoches, and eminent monastics. H.H. Mahavairocana Dharma King Zunsheng has recognized the identity of and has made written predictions about H.H. Dorje Chang Buddha III, who is an incarnation of the primordial Buddha. The Buddha name of the third Dorje Chang Buddha is H.H. Dorje Chang Buddha III Wan Ko Yeshe Norbu. In 2006, the publisher distributed some of the initial manuscripts of this book about the accomplishments of H.H. Wan Ko Yeshe Norbu. After famous great dharma kings and rinpoches of the highest order in the world read that initial manuscript, all of them were very moved and astounded. They wondered what being of holy virtue has descended into this world and how such a being is able to manifest the pinnacle of realization not manifested by anyone else in the past few thousand years of Buddhist history. Those dharma kings immediately practiced dharma and entered a meditative state in order to evaluate and affirm the true identity or status of H.H. Wan Ko Yeshe Norbu. Thus, the karmic conditions matured for the occurrence of a great event in Buddhism. More than three holy great dharma kings who are incarnations of Buddhas or Mahasattvas and more than ten holy masters issued formal documents recognizing the identity of His Holiness and congratulating Him, thereby exceeding the minimum requirements of the dharma. Those masters of great holiness confirmed that H.H. Wan Ko Yeshe Norbu Holiest Tathagata is the incarnation of Dorje Chang Buddha, the master of the Five Buddhas in the five directions and other Buddhas. Each of those masters of great holiness is a famous personage of the highest level in the world today and is an incarnation of a Buddha or Bodhisattva. Among such masters of great holiness are the following four people: The world-renowned supreme leader of the Sakya sect, H.H. Great Vehicle Dharma King Sakya Trizin, who is a true nirmanakaya of Manjushri Bodhisattva; H.H. Dharma King Omniscience Jamyang Lungdok Gyaltsen, also known as Lama Achuk. His Holiness is the incarnation of Venerable Longsal Nyingpo, who was one of the twenty-five great disciples of Guru Padmasambhava; H.H. Dharma King Mighty Lion Renzeng Nima, who is the incarnation of King Gesar; and H.E. Master Urgyen Xirao Woxiu, who is the incarnation of Urgyen Lingpa, an outstanding disciple of Guru Padmasambhava. This master of Tibetan esoteric Buddhism is known as an extremely holy being in modern Tibet who possesses great supernatural powers. 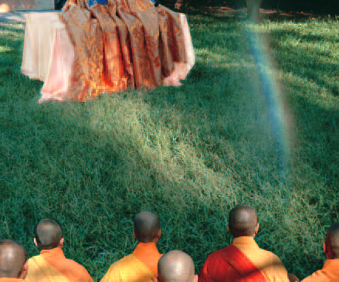 Great Perfection Rainbow State at the Vajra Throne. The photograph on the left was taken at the time when the holy scene was being viewed. In the course of benefiting living beings in this world, H.H. Dorje Chang Buddha III Wan Ko Yeshe Norbu Holiest Tathagata has unintentionally revealed His state of virtue and realization. This has truly enabled us to widen our knowledge of the realization, great compassion, enlightenment, and most magnificent conduct of a Buddha. Holy phenomena can be seen wherever H.H. Dorje Chang Buddha III goes. Such phenomena appear when His Holiness conducts initiations for and transmits dharma to eminent monastics, rinpoches, dharma kings, or even famous Bodhisattvas. Such phenomena also appear when His Holiness gives discourses on the dharma to His disciples or when His Holiness blesses living beings to increase their good fortune and wisdom. Examples of such holy phenomena include the following. Both humans and non-humans have prostrated to H.H. Dorje Chang Buddha III and have listened to His Holiness’s discourses on the dharma. Sentient beings, non-sentient things, birds, aquatic animals, land animals, flowers, grass, trees, tiles, and stones have all expressed respect for His Holiness’s dharma discourses either verbally or through physical actions. His Holiness taught a disciple how to transmit dharma on His behalf. When the person who was transmitted dharma by that disciple passed away, that person’s body emitted light. Thunder rumbled in the sky in reaction to the voice of His Holiness. Under instructions from H.H. Dorje Chang Buddha III, Amitabha Buddha escorted people to the Western Paradise of Ultimate Bliss to visit there before they passed away. After one of them returned from his visit, His Holiness set a time for him to pass on to that Pure Land. Also under the instructions of H.H. Dorje Chang Buddha III, someone who was already being escorted to the Western Paradise returned to the human realm. Many people saw Aksobhya Buddha and the Long Life Buddha appear on the clouds in the sky and bestow this Buddha-land nectar. This is how the Buddha-land nectar originally looked when it descended, as nobody touched it. When this Buddha-land nectar was descending, the seven types of Buddhist disciples surrounded the bowl and respectfully chanted mantras. They personally saw the Buddha-land nectar emit flashes of light as it descended into the totally empty purple gold-copper bowl. The Buddha-land nectar descended into the bowl from a height of tens of thousands of feet, yet not one bit of it fell outside of the bowl. Moreover, the Buddha-land nectar clearly quaked in the bowl. Those Buddhist disciples who were there ate the Buddha-land nectar. Nothing on earth can compare with its delicious taste. Various strange illnesses were cured on the spot, including middle and late-stage cancer, which immediately vanished. H.H. Dorje Chang Buddha III Wan Ko Yeshe Norbu Holiest Tathagata is the true incarnation of Dorje Chang Buddha. Thus, all conduct of H.H. Dorje Chang Buddha III is that of a Buddha, whether it be teaching disciples how to walk the path of enlightenment or saving living beings who are in the midst of hardship. Examples of His Holiness’s holy realization are too numerous to describe. One example involves the great layman Huibang Huang, who was a professor at Jiangxi Teacher’s Training University and vice-chairman of the Jiangxi Buddhist Association. At the age of ninety, he had never personally seen Amitabha Buddha. He had hoped to see that Buddha. H.H. Dorje Chang Buddha III agreed to his request and gave him one opportunity to see that Buddha. Writings on the Buddha-dharma by H.H. Dorje Chang Buddha III Wan Ko Yeshe Norbu Holiest Tathagata are treasures that are difficult to encounter in millions of eons. 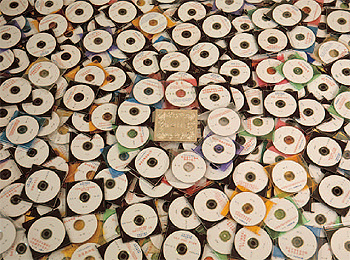 A few examples include Sutra on Understanding and Realizing Definitive Truth, What Is Cultivation?, Commentary on the Prajnaparamita Heart Sutra (the brief commentary is 40,000 Chinese characters and the somewhat detailed commentary is 380,000 Chinese characters), A Monk Expounds the Absolute Truth to a Layperson, and Correcting the Treatises of Patriarch Bodhidharma. In this last writing, His Holiness corrects the mistakes that the great Chan (Zen) Patriarch Bodhidharma wrote in his treatises that have been handed down from generation to generation. What is most precious Nectar? A Holy and Pius Vow! © 2008 True Buddha Dharma.Org. All rights reserved.